There is only one freshwater natural lake on the island of Sardinia; it is Lake Baratz (n.1 on map) in the northwest, in the province of Sassari near the town of Alghero. It is small and almost at sea level (elevation 24 meters/80 feet); the surface area is 0.6 km²/c.160 acres.) The other lakes on the island are all the result of the damming of rivers; they have produced a number of fair-sized bodies of water, some of which are discussed here. Originally, the lakes were meant for agriculture and the production of hydroelectric energy; now they serve recreational purposes as well. (Indeed, the photo centered as an insert, top, is the small paddle-wheel of the river boat shown in this photo on the left). The lake in the photos is Lower Lake Flumendosa (n.2). The navigable portion of the lake is 17 km./10.5 miles long and is quite scenic.The Flumendosa river, itself, that feeds the lake is Sardinia's second longest (after the Tirso river) and is 127 km/79 miles long. That river is also dammed farther to the north, where it forms Upper Lake Flumendosa (n. 7); that dam was built in 1947-48. The upper lake is 6 km/c.4 miles long and 1.5 km/c.1 mile wide. 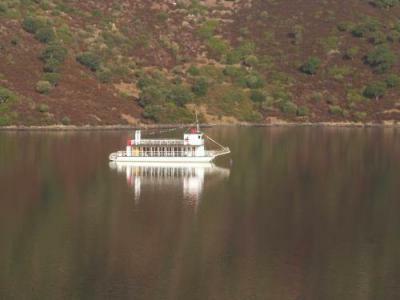 Lake Coghinas (n.3) is in the north between the provinces of Sassari and Olbia-Tempio. 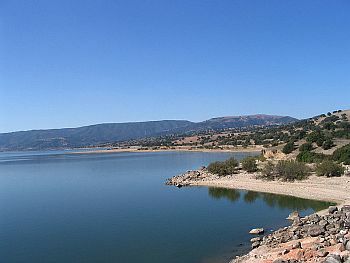 With a surface area of 17.8 km²/7 miles² and a capacity of .25 km3 of water, it is the second largest lake on Sardinia (after Lake Omodeo, below) and one of the major reservoirs in Italy. The dam was built in 1924; it is 185 meters long and 58 meters wide. It serves for water supply as well as hydroeletric power. The lake is now a popular tourist attraction, and the shores host a youth hostel, restaurants, and a sailing club. Lake Coghinas is fed by the river of the same name, itself formed by the confluence of the Mannu di Berchidda and Mannu di Ozieri rivers. Lake Omodeo (n.4) is in Barigadu, one of the historical regions of central west Sardinia. The lake is the largest artificial one (20 km long) on the island and one of the largest in Italy. It was formed between 1919 and 1924 by the construction of the Santa Chiara dam on the longest river in Sardinia, the Tirso, at the town of Ulà Tirso. The construction employed 16,000 workers. It was an impressive bit of engineering, and the resulting lake was at the time actually the largest artifical one in Europe. The lake was named for the chief engineer of the project, Angelo Omodeo. A new dam was built in 1997, dedicated to the Sardinian medieval judge/ruler Eleonor of Arborea; it is 582 meters long and 120 meters wide. The dam serves for irrigation and hydroelectric energy. Lake Gusana (n.5) is the name of the artificial lake and the surrounding area, in the territory of Gavoi in the province of Nuoro. The lake was formed between 1959 and 1961 by damming the river Gusana between mount Littederone and Nodu Nos Arcos. Besides producing hydroelectric energy, the lake is close to the archaeological sites of Santu Mikeli, to the domus de janas in S'Iscrithola and to the megalithic complex of Perdas Fittas. For this reason, accommodation facilities have risen on the shores of the lake to handle visitors. Lake Liscia (n.6) is in northern Sardinia near the towns of Arzachena and Luogosanto, in the Gallura region. With a capacity of 105 million cubic meters of water, it is the principal reservoir in north-eastern Sardinia. The dam was built in 1964. Lake Mulárgia (n. 8) is the overflow formed from Lower Lake Flumendosa (n.2). That water, in turn, is channeled down towards the reservoir for the city of Cagliari at the southern tip of the island. Lake Cedrino (n.9) was formed by the damming of the Cedrino river in the valley between Mt. Tului and Mt Bardia in order to facilitate irrigation in the fields near Dorgali. It is also a popular area for kayaking and canoeing. Lake Posada (or Maccheronis) is a relatively large lake in the hills of the northeast, not far from the towns of Torpè e Posada (near n. 5 on the map), both in the province of Nuoro. The lake is very deep in many places right at the shore line and displays an extremely irregular shape. Lake Flumineddu is a bit to the east of Lower Lake Flunedosa (n.2) between the towns of Seui and Ulassai. It is a large lake and is part of the entire Flumendosa complex of artificial bodies of water that provide irrigation and electrical power to the populated area in and around the capital of Cagliari directloy to the south. 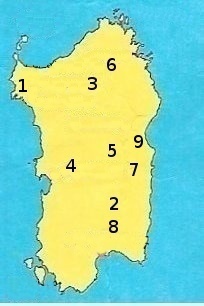 L. Lerno, L. S. Giovanni, L. Monte Pranu, L. Cuga, L. del Termo. One of the principal uses for these and other lakes on the island of Sardinia is the production of hydroelectric energy. This has put Sardinia in the enviable position of being self-sufficient in terms of electricity. A blackout in late September, 2003, was the worst one in Italy since WWII, affecting 55 million people and putting the entire peninsula in the dark for a number of hours—all except for Sardinia. I was on the island at the time and watched the news about the mainland blackout on television. It worked fine.